Postal address (books, samples) : please ask! There are various on-going long-term projects revising large, well known and important Mesozoic coral faunas, all in close cooperation with colleagues from Europe. Estimated duration will be five to ten years, but we are making good progress. In June 2018, the second edition of my book on Jurassic and Cretaceous corals (in German) was published. Based on the revision I published in 2016, the systematic part was profoundly revised. In summer 2019, the revision of the corals of the area of Rußbach/Gosau in Austria (Coniacian/Santonian) will be published. This will be a 450 pages book with approximately 1200 figures encompassing the description and illustration of 350 coral species (more information about the project in German at http://www.korallen-kreide.de). Most species will be illustrated using thin sections and morphometric data will be provided (new for that area). There will be an abridged version in the English language as PDF free of cost. The Hauterivian coral fauna of the Paris Basin (France) is envisaged as a monographic work. Large "monolithic" books became more important to me during the last years. Albian/Cenomanian coral faunas world-wide, mainly France, Germany, Mexico, Spain (results of the UNAM DGAPA projekt IN101111). Early Cretaceous coral faunas from Mexico (Sonora, Puebla, Baja California, ?Oaxaca). Partly carried out by my students. Various coral faunas reaching from the Berriasian to Cenomanian of Spain. Much interesting and new material. Late Jurassic and early Late Cretaceous from Portugal. Revision of type material from the MGSB collection in Barcelona is published step by step. Late Cretaceous to Oligocene coral faunas of Costa Rica. People often ask me whether I can determine coral samples for them. At least I can try. Since the amount of the samples increased in the last years, I kindly ask you to lookup these instructions. - Other persons ask me whether we can publish a coral fauna together. Of course we can. Please lookup the procedure. Do not hesitate to ask for reprints and/or PDFs. I do not send anymore reprints automatically and I do not send PDFs as well. You have to ask. PDFs of free articles are linked in the above pages. PaleoTax/Database – database to record taxonomic, geographic, stratigraphic data. A new version (May, 31, 2018) is available. PaleoTax/Graph – PaleoTax Graphic extension to visualize results of data analysis. PaleoTax/Measure – program to measure two dimensional fossils (and count things like septa or pores or leafs) and calculate average, standard deviation, first interval etc. - Current version is 1.6 and was released in March 2018 including a new manual. There is also a manual in the German language for version 1.6. NEW: Curso corto (25h) 10-14 Junio 2019 en la Facultad de Ciencias en la CDMX – Metodología de investigación en paleontología. 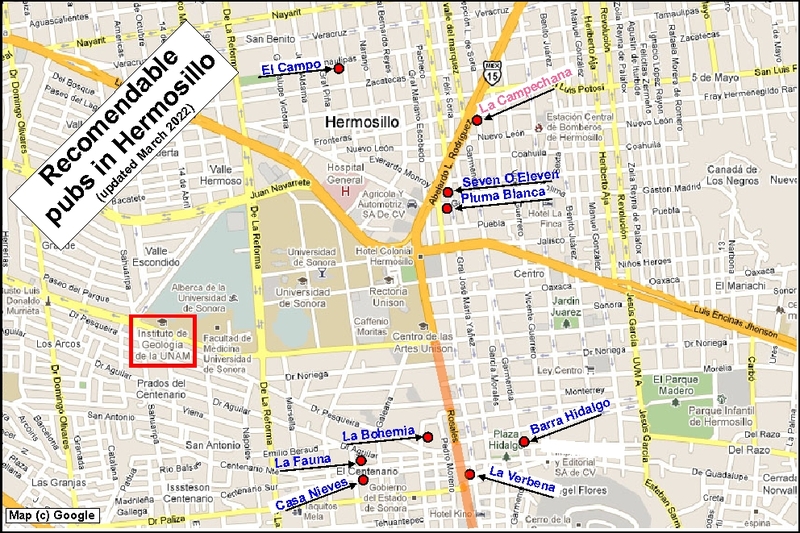 Students need to come to Hermosillo, even if only a short time. Foráneos tienen que venir a Hermosillo, al menos un tiempo. List of students - who have worked / are working with me, and on what. Informaciones para estudiantes (estancia de investigación, práctica profesional, servicio social, tesis). Languages : Deutsch, English, Español, Français, porusski, nihon-go. ... in the backyard of my house in Hermosillo (there is always cold beer). Thanks to Heidi for taking a picture in the Lichtentanne Sailor's home, and to an unnamed waiter at the El Barrilito pub, Guanajuato.